Ground driving acclimates the horse to voice and rein aids without the complication of a rider on his back. It is useful through all stages of training, but usually is introduced after the horse learns to lunge and before he is broken to ride. This exercise focuses on turning left and right, circling, halting, backing up, and transitions between gaits. 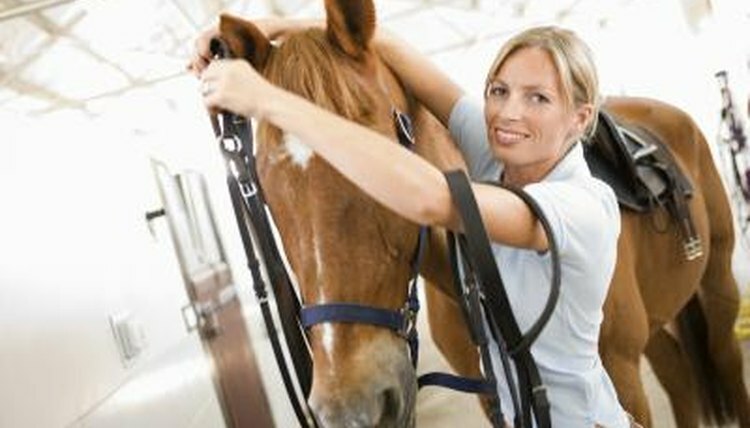 Groom and tack up your horse just as you would for a lunging or riding session. A surcingle works best for ground driving because there are fewer pieces to get in the way, but you can use a western or English saddle instead. Place the saddle pad under the saddle or surcingle, then put a snaffle bridle over your horse's halter. This gives you the option of using the halter or bridle for steering depending on your needs in the arena. Walk your horse to a round pen or arena. If you are working with a saddle, tie the stirrups together underneath the horse's barrel with a short lead line or rope. This keeps them from swinging against his sides while ground driving. Attach the buckle of each lunge line on either ring of the horse's halter or bridle. Thread the slack through the stirrups from outside to inside, then set the coiled lines on top of the saddle or surcingle until you are ready to begin. When using a surcingle, thread the lunge lines through the middle ring, which is halfway between withers and belly. Hold the left lunge line in your left hand and your right lunge line in the other. Stand two or three feet to the left of your horse with the right lunge line draped over his hip. Ask your horse to walk forward by giving a voice command, such as "walk" or "walk on." Feed out the lunge lines as he moves forward and allow the right lunge line to slide over his hip. Walk behind your horse with gentle contact through the lunge lines. Turn your horse to the left by increasing contact with the left lunge line and giving with the right. Maintain light contact until your horse gives his nose in the direction you requested, then release. Make several turns to the left and right at the walk before moving on. Halt your horse by giving a voice command, such as "whoa," and pulling gently on both lunge lines at the same time. Continue applying pressure to the lines until he comes to a complete stop. Reward him by releasing the pressure. If he does not stop, increase the pressure until he obeys. You also can turn him in a tight circle until he halts. Ask your horse to back up from the halt by applying give-and-take pressure to both lunge lines. Add a voice command, such as "back" or a "shhh" noise. Decide in advance how many steps you want your horse to take in reverse; start with four or five steps, then increase slowly over many sessions. Ask for the reverse until he completes the prescribed steps, then send him forward to reward him.  Lunge your horse for five minutes each direction to warm up before ground driving. Starting with a familiar exercise will soften and relax your horse.  Use the inside lunge line to give your horse directions and the outside lunge line to drive him forward. If your horse is sluggish, swing the outside line against his hip, then click or kiss to him. ⚠ Never let the slack of your lunge lines trail on the ground. They could trip you or your horse. ⚠ Walk at least six feet behind your horse when ground driving so your horse cannot kick you. ⚠ Avoid harsh bits for ground driving. Since hand aids are key in this exercise, bits harsher than the snaffle can harden the horse's mouth, resulting in insensitivity.